If you love bigfoots like I love bigfoots, you are always looking for things to do that might help them in some small way. Even at this point in time, before discovery, there are many things we can do to help our hairy cousins in the woods. Some are political, some are monetary, but most are simpler than that. Before I get specific… In general, as a bigfooter, anything you do should be done in a professional manner. That involves being a positive force, whether that is in person or online. Being negative, whether it’s trolling online, talking crap about other people, making statements that bully others, or any number of other things one can do that lack maturity makes us all look bad. Remember, the vast majority of people who are interested in bigfoot are not part of the bigfoot community, and when they peek in on us and see bitter infighting and childish name-calling, it would probably turn them away from not only the community, but the subject itself. Behave yourself, no matter what else you do. If you have trouble being kind and positive, then the most important thing you can do for bigfoots is to remain silent. I was asked to compile a list of specific things one can do to help sasquatches. Below is a list of five simple things that one can do that would have a direct impact on bigfoots, even before their discovery. They are simple things, with little or no monetary or personal impact. In some ways, they are literally the least we can do without doing nothing at all. Vote with bigfoot on your mind. As we approach each new and crazy election season, keep in mind that those folks we’re putting in office can occasionally have an effect on sasquatches. This is true whether we are talking about an election on the federal, state, or local level. When it’s my turn to cast a ballot, I always take into consideration a candidate’s environmental record. Which candidate is on record saying that he/she will cut back on environmental pollutants? Which candidate is a proponent of preserving wild lands? Which candidate will help bigfoots the most? Vote your conscience. Vote for bigfoot. Pick up litter. This is especially true when you’re in the forest. I suspect that sasquatches don’t appreciate humans coming into their forest homes and leaving trash around. After all, if the tables were turned and bigfoots were leaving deer carcasses and such (their trash) in our living rooms, we’d be pretty ticked off. Besides, as my friend Thom Powell suggests, maybe a bigfoot will see you picking up litter in the forest and slowly learn to trust you because of it. Anything’s possible! Choose a worthy environmental cause and donate to it. You can donate either time or money, and you don’t have to donate very much of either to make a difference. I have a small number of charities and organizations that I donate to, and the worst thing that comes of it is an occasional email from the group asking for a bit more. There are many worthy causes that can use your help, and I’m certain that there’s one out there that would resonate with you and your beliefs. Remember, such donations are usually tax deductible. Learn about bigfoots. For most folks, that means reading a variety of books on the subject, as well as about other related subjects like tracking, ecology, geology and more. The more we know about bigfoots and their habitat, the more real they get. By knowing as much as possible about bigfoots, you’ll be able to speak about them with more authority. Talk about bigfoot with others. If you do this in a respectful and toned-down sort of way, you can do a lot of good for sasquatches. Most regular people have no idea that bigfoots are real creatures or how they fit into the landscape. They think bigfoots are a myth or folktale. When people start to understand the breadth of data available that supports the hypothesis that bigfoots are real animals, they might start opening their minds to the subject a bit. Be careful to not try to convince anybody of anything. You don’t want to seem like your trying to gain converts or something. It could end up in an argument or worse. Just inform the masses. These are simple actions that anyone can perform to help sasquatches. We are their advocates, and we should act accordingly. Be sure to act in their best interests with a positive attitude. Remember, what you do in public or online reflects all bigfooters. They have no voice. Be their voice. Politicians can be a weird bunch of folks. (I won’t go into the numerous ways they frustrate me and offend my sensibilities.) However, every once in a while one breaks the mold and does something overwhelmingly right. I love it when a politician shows the desire to help the world through creativity and a love for bigfoot. Sen. Ann Rivers has done just this, and for the second time! She is proposing legislation to make a special edition sasquatch license plate for the state of Washington where the proceeds would go towards state parks and other habitat. Read on to learn more about this move! OLYMPIA… Sen. Ann Rivers thinks the state’s best-known cryptid, Sasquatch, ought to have an opportunity to help raise money for state parks and recreation areas. Today she introduced legislation that would create a Sasquatch license plate and direct revenue from its sales toward park maintenance and improvements. Senate Bill 6151 complements Rivers’ effort to designate Sasquatch as the state cryptid – short for cryptozoological creature, which refers to an animal not proven to exist. Senate Bill 5816, which would add Sasquatch (or “Bigfoot”) to the collection of state symbols, was inspired by a letter she received from a young constituent in early 2017. SB 6151’s co-sponsors include the Senate Transportation Committee’s Democrat chair and lead Republican, and Rivers is hopeful the bill will come before the committee later this month. Rivers, who says the idea for her legislation came from a friend, was among a bipartisan majority of senators who supported last year’s legislation to invest hundreds of millions of dollars in park maintenance and improvements. The bill went nowhere in the House of Representatives, however, and money from the special state-parks license plate created in 2006 only supports arts and education in parks. “This won’t generate the $500 million that our Senate bill from last year would have, but the proceeds can’t help but make a dent in the backlog of maintenance that we were wanting to address,” Rivers explained. “The strong positive reaction to my bill to make Sasquatch the state cryptid proved that people of all ages are still taken by the idea that such a creature is out there. 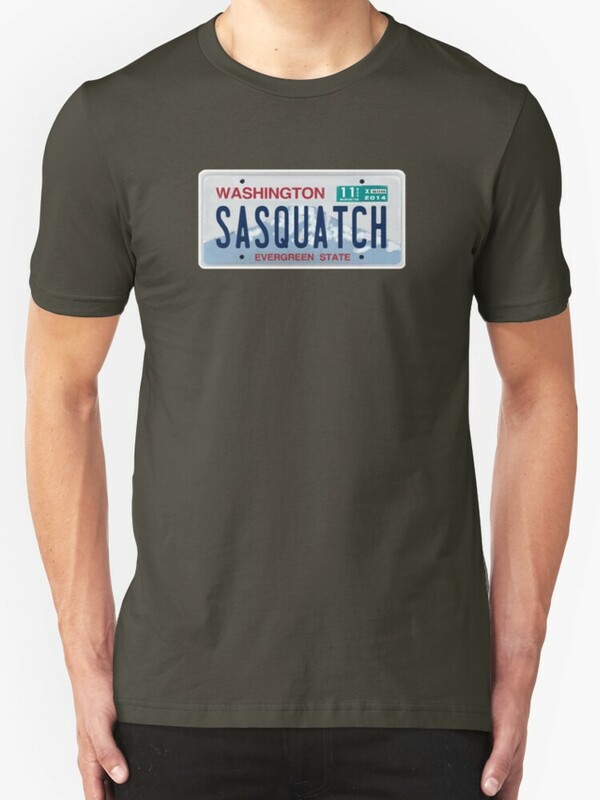 I have no doubt that some of them will like the idea of a Sasquatch license plate, and appreciate that buying one is good for the park system,” she said. Washington moves to make sasquatch the state’s official cryptid! Sasquatch is everywhere nowadays, and I’m not just talking about in the woods. You can see sasquatches on billboards, commercials, and everybody’s favorite reality TV series. Strangely enough, though, there is not a single mention of the creatures in the state laws of Washington despite the tourism dollars brought there by the hairy hominoid (though there are a couple local ordinances). That might be about to change. Senator Ann Rivers who represents the 18th Legislative District in Washington has proposed a bill to make sasquatch the official state “cryptid,” or undiscovered animal. This was brought on by a letter from “Caleb,” a boy who lives in her district. Some might complain that this sort of thing doesn’t belong in the solemn halls of legislative government, but I would strongly suggest otherwise. A very large sum of money is spent in Washington every year by bigfooters coming to conferences, paying for campsites, buying gasoline, buying souvenirs, and going on paid expeditions looking for evidence of sasquatches. These bigfooters therefore use the public lands set aside by the state, thus ensuring their protection for future generations. Clearly, bigfoots have played a small yet significant role in Washington’s tourism and public lands. I predict that as bigfoots become more prominent in the minds of the public, and especially after academic acceptance of the species, they will play a huge economic role in Washington and other states. How will they be protected? What, if any, rights will they be granted to ensure their safety and autonomy? Will they be viewed as threats or assets? How will our own views of the lands they live on be changed? All these questions and more will surface, so it’s a good thing to put sasquatches on the minds of Washingtonians now, before they are proven as a real species, so some of these questions can be pondered before answers are demanded. OLYMPIA… Washington’s Legislature has adopted more than 20 state symbols, from a state tree to a state folk song and, most recently, a state oyster and a state waterfall. But the state doesn’t have a designated “cryptid,” or cryptozoological creature – meaning an animal not proven to exist, such as Scotland’s Loch Ness Monster. Nor does state law make a single mention of Sasquatch, also commonly referred to as Bigfoot and sometimes Forest Yeti, even though an organization of bigfoot researchers rank Washington as the national leader in sightings of the legendary being. Skamania and Whatcom counties adopted Sasquatch-protection laws more than a quarter-century ago. Enter “Caleb,” a boy in Sen. Ann Rivers’ southwest Washington legislative district, who wrote a letter suggesting official status for the being that was once the mascot of the long-departed Seattle SuperSonics professional basketball team and the focus of a major 2010 exhibit at the Washington State History Museum. Read the rest of the article by clicking this link.